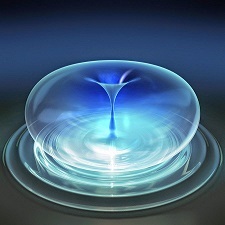 ‘Bubble Power’-the revolutionary new energy source. It is working under the principle of Sonofusion. For several years Sonofusion research team from various organizations have joined forces to create Acoustic Fusion Technology Energy Consortium (AFTEC) to promote the development of sonofusion. It was derived from a related phenomenon known as sonoluminescence. Sonofusion involves tiny bubbles imploded by sound waves that can make hydrogen nuclei fuse and may one day become a revolutionary new energy source. Bubble fusion, also known as Sonofusion, is the non-technical name for a nuclear fusion reaction hypothesized to occur inside extraordinarily large collapsing gas bubbles created in a liquid during acoustic cavitation. In other words, Sonofusion involves tiny bubbles imploded by sound waves can make hydrogen nuclei fuse. With the steady growth of world population and with economic progress in developing countries, average electricity consumption per person will increase significantly. Therefore, seeking new sources of energy isn't just important, it is necessary. Much more research is required before it is clear whether sonofusion can become a new energy source. Even it is not yet successful, the evidence already shows a big future of sonofusion which might be the new source of cheap clean energy in our life.